I would've posted this earlier but the only audio footage I had of it was from a live performance. 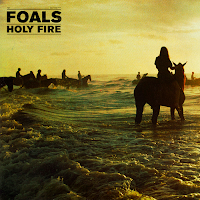 Anyways, here's the latest single from the much anticipated Foals album Holy Fire and I'm liking this one much more than "Inhaler". It speaks to me and in my opinion is a little more Foalish (yep I made this word up). Still I'm digging the evolution of these guys but it's still nice to hear something familiar with the precise deliverance.